The Laboratory provides shuttle bus services, contracted through MV Transportation Services. Routes run throughout its 200-acre facility, downtown Berkeley, local off-site facilities, UC Campus, Downtown Berkeley BART, and Rockridge BART stations. Shuttles offer free wifi onboard. Riders are asked to adhere to riding instructions. Shuttles run Monday through Friday, except Laboratory holidays. There is no weekend service. Special service for tours, group travel, etc. is available for a fee. All shuttles are equipped with Nextbus which uses GPS technology to enable riders to obtain real-time information on bus arrivals. 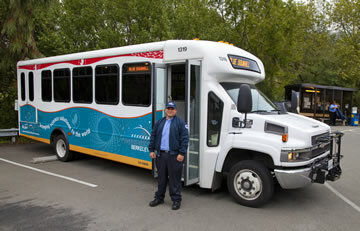 Contact Bus Services at [email protected] or 510-486-4165 to provide comments, compliments, feedback, or suggestions.